Daredevil: Back in Black Vol. 8: The Death of Daredevil Review – AiPT! Daredevil must confront his twin and death in Charles Soule’s final story arc. When a writer as good as Charles Soule announces their departure from a comic like Daredevil, you pay attention. His work on the series was revered thanks in part to his previous employment as a lawyer, but also integrating new characters like Blindspot while honoring the past. In this final story arc, Soule brings back surprise character Mike Murdock, wraps up Kingpin’s mayoral role, and so much more. This is not only Soule’s last big statement on the character, but it’s also drawn completely by excellent artist Phil Noto. That makes the narrative cohesive since it’s all by one creative team. Soule is clearly having the time of his life on this book. 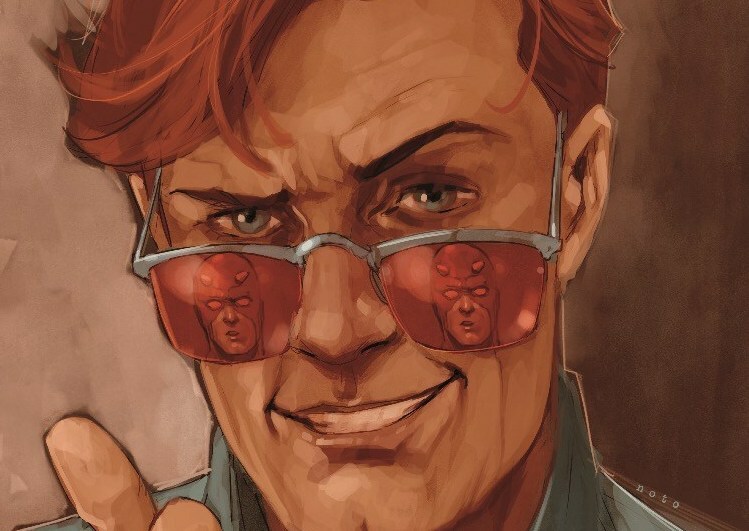 He’s using Inhuman characters we’ve grown to love thanks to his previous stories, and he’s playing around with Daredevil history in a fun way. The biggest addition to the narrative is Mike Murdock, who was originally a fake twit Matt pretended to be so he could live life to the fullest. I reviewed a recent “Epic Collection” highlighting this character so it’s fun to see him back in a brand new form here. In a sense, Soule gives this Mike Murdock twin a true purpose and a better take than the original zany nature of the character. This issue also features plenty of villains on top of the Kingpin takedown. Electro, Hammerhead — you name a villain Daredevil has tussled with in the past, and they appear. There’s also a new Catholic villain named Vigil that brings the fight scene heat. Phil Noto brings his A-game to the proceedings as well. The sometimes dreamlike color choices and painterly quality of the book gives it a heightened sense of importance. You can tell Noto and Soule are on the same wavelength, mixing a simplistic combination of storytelling and plot progression. I can’t wait to see them work together again. There is great detail in each panel and that makes even the least action-heavy scenes interesting to look at. Mike Murdock even has a slightly different look to Matt and Noto captures that difference well. You might think you know what is going on, but you have no idea! The ending is poetic, but also such a shock it feels a bit cheap. I won’t spoil it, and while Soule does write some of his most beautiful prose, it doesn’t quite work. It obviously hurts knowing full well Chip Zdarsky’s Daredevil run is on the way, which always reduces the weight of a “death” in comics. Another element that doesn’t quite work is how Mike Murdock is used. It’s exciting to see the character and have Matt figure out who he is and what he’ll do with him, but at a certain point, the character becomes obsolete in the story. One has to wonder if Soule painted himself in a corner and, with so few pages left to wrap things up, ditched Mike and then rushed his twist ending along. It ends up being a bit rough around the edges. Some inspired story decisions and a beautifully written last few pages make this a fun romp in the Daredevil corner of the universe. Alas, it’s not the cleanest ending. Some inspired story decisions and a beautifully written last few pages make this a fun romp in the Daredevil corner of the universe. Alas, it's not the cleanest ending.